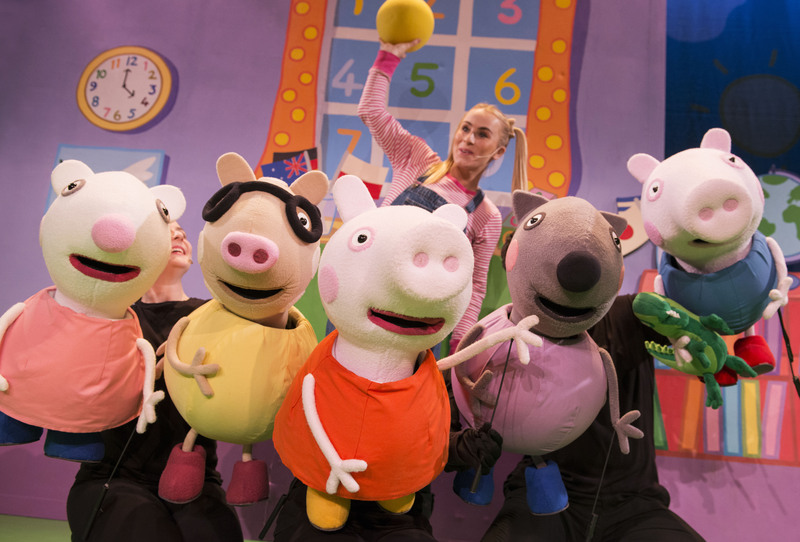 Peppa Pig – loved by toddlers everywhere and now in the West End to splash you with her own brand of muddy fun. 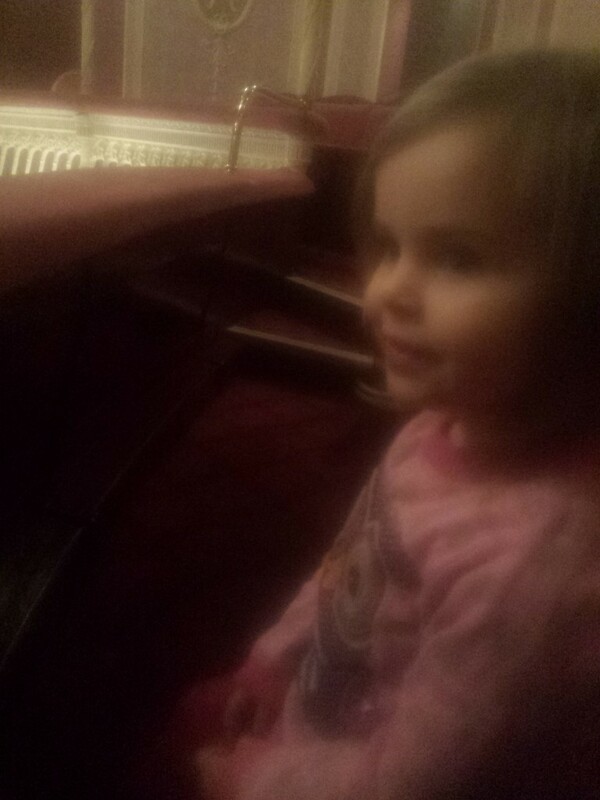 We visited Peppa on Friday, arriving at the Criterion Theatre with an overtired Eva just falling asleep in the buggy and an overtired mother pushing it (I’d been out drinking lemonade and dancing to Boney M till almost eleven the night before….who said my wild days were over?). It was raining and we were early so we’d ducked into St James’ Church on Piccadilly for a few minutes to listen to the end of a free piano recital and shelter from the rain. The latter bit we did very well, the former not so much as we happened to bump into an old Kennington friend and spent a lovely ten minutes gossiping rather than listening. The piano recital sounded lovely though, and they’re on three times a week – you should go. Obviously such high culture was a good preparation for what was to come, so cheered up I strolled on, willing Eva to stay awake until we reached the theatre. When we got there, she was pretty much asleep but we were told you have to fold all buggies before going in so I had to turf her out into the drizzle. 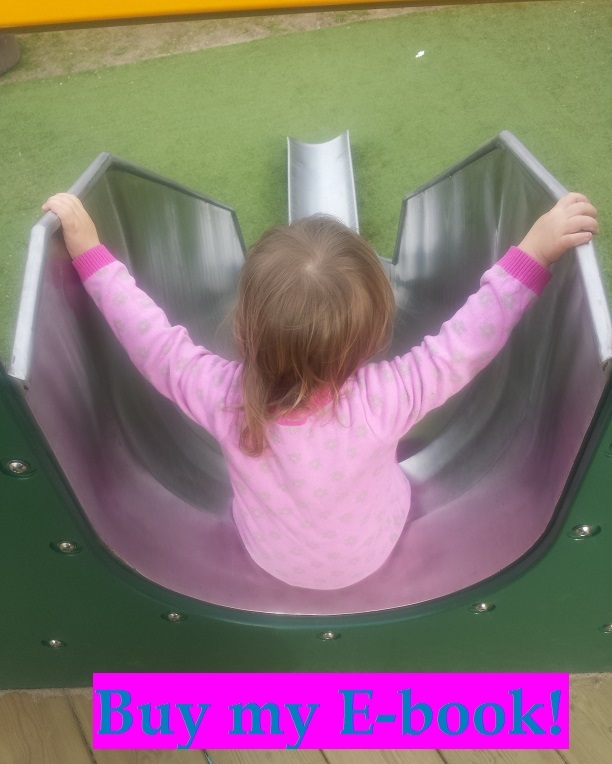 This could have gone badly wrong, but luckily she clocked what was going on (“Oh, dat’s Peppa Pig!) and perked up immediately. Not so luckily, our new buggy completely refused to fold down. I panicked for a minute, devising rapid plans to dump it at my office and come back but I was allowed to take it in unfolded as long as I carried it down the stairs. Not a huge problem given it’s pretty light (and weirdly, the same weight unfolded as it is folded) but when we got to the buggy park, we again were asked to fold it and again I couldn’t. If I’d realised we’d needed to fold I would have taken the old, green one which has an eccentric steer and a bit of a squeak but does definitely fold. They eventually agreed I could leave it as it was, given it took up less space than a travel system would folded, but it was all a bit of a faff. Top tip – if you’re going to see Peppa, take the lightest, foldiest buggy you can! Once we were seated though, all was calm and bright. Well, as calm as it can be when you’re in a theatre full of toddlers. Eva was delighted with her ingenious programme/sticker book that kept her entertained while we waited for curtain up and we were handily close to the loos – essential for a potty trainer on the go. 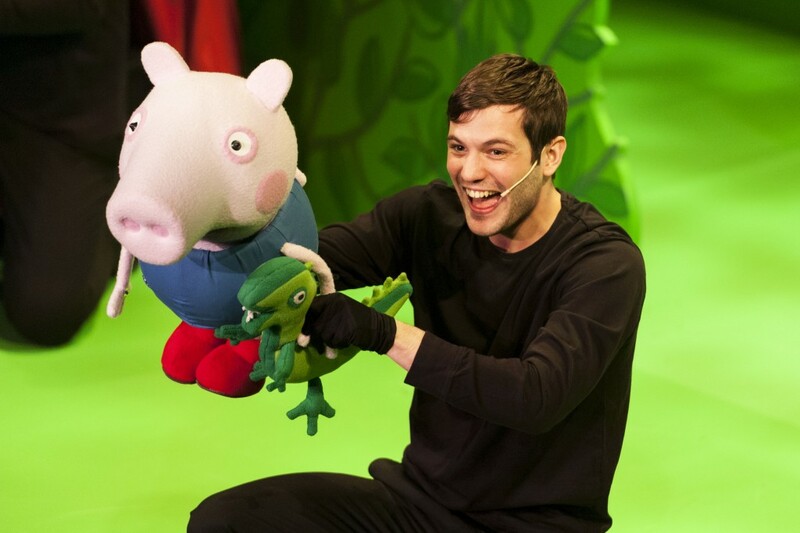 But very soon the curtain was up and Peppa’s friend Daisy (a human!) was there to explain she was playing hide and seek with some other friends on the brightly coloured set. Danny Dog, Suzy Sheep, George and Pedro Pony all peeked out from behind bushes and castles to squeals of delight from the audience. I was beginning to see what Richard Lewis meant about creating noisy spaces in shows. The excitement built until finally Peppa herself popped out too. Cue much giggling and cheering, from the cast and the kids. The characters were all puppets, operated by actors in black. While the actors were often quite discreet, using the set to hide behind, they did come out for the songs – I imagine to give the songs the kind of volume and energy you cant get from puppets! Interestingly though, when I asked Eva if there were any humans in it she said “only Daisy” so she can’t have noticed the puppeteers. Handy to know if you’re deeply concerned about your 2-year-old and the fourth wall. 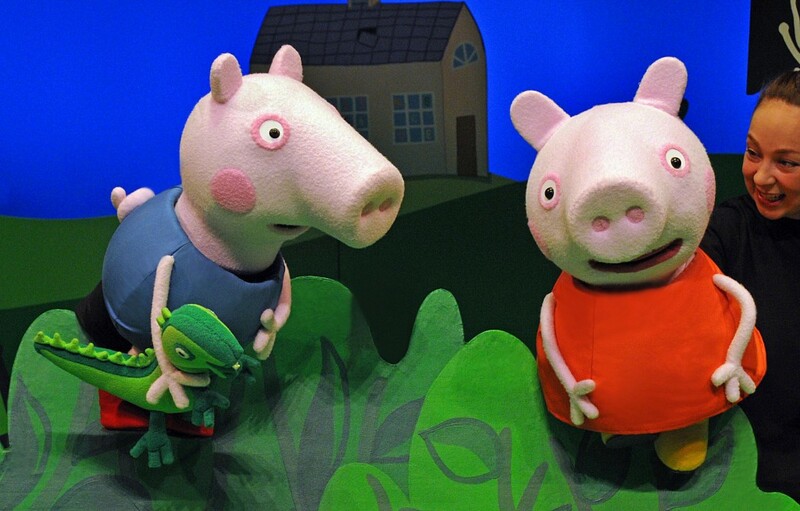 She does remember a lot about the show though, two days on – she talks constantly about seeing “Peppa at de theatre” and singing “Jingle Bells”. Because, oh yes, there was a Christmassy theme to this. But I’m getting ahead of myself. The main plot concerns a fair to raise money for the school roof which, once again, is leaking. Leaving aside the question of whether Madame Gazelle should sue Mr Bull for his negligence, it’s a pretty classic Peppa kinda storyline. Peppa and her friends organise the fair and a muddy puddle jumping contest, where Daddy Pig strives to defend his champion status. At 90 mins, including an interval, it’s obviously going to be more padded out than your average episode but it didn’t lose Eva’s attention at any point. She was perfectly happy to watch the friends messing around, playing, singing and throwing a ball to each other without feeling the need to drive the action on. There were some very creative moments of audience participation – the ball was on a long stick which went out over the stalls, and when George cried, real water sprayed out. There was also a good dollop of the kind of “he’s behind you!” moments you’d expect in this kind of show. It was very engaging for the kids and lots of fun. There were a few very young toddlers there who were a bit restless, but it’s risky taking a 1-year-old to any kind of theatre production. Eva’s 2 and a half now and I’d say it was perfect for her. She’s also a Peppa Pig obsessive, which helps. So, it was a full-on, full-colour toddler delight – not one for hungover parents (hence sticking to the lemonade the night before) but an absolute joy to watch for 2-year-olds. Disclaimer: I received free press tickets for “Peppa Pig’s Big Splash” in exchange for the review. All opinions remain honest and my own. This entry was posted in Reviewing the Situation and tagged Central London, Peppa Pig, theatre. Bookmark the permalink.